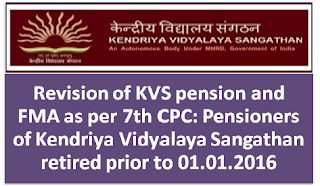 Sub: Revision of pension in respect of pensioners of KVS retired prior to 01.01.2016 in respect of 7th CPC. 1. OM No. 38/37/08-P&PW(A)(l) dated 04.08.2016. 1. In case of pensioners retired prior to 01.01.2016, the revised pension/family pension with effect from 01.01.2016 shall be determined by multiplying the pension/family pension, as had been fixed at the time of implementation of 6th Central Pay CommissionlCPC) (pension drawn on 31.12.2015) by 2.57 in terms of OM NO. 38/37/2016-P&PW(A)(ii) dated 04.08.2016. The amount of revised pension/family pension so arrived at shall be rounded off to next higher rupee.” The revisedpension/family pension will be the basic pension/family pension only without the element of additional pension available to the old pensioners/family pensioners on attaining the specified age. 2. The revised pension in accordance with 7th CPC will be applicable with effect from August 2018. The arrears of pension (w.e.f. 01.01.2016) will not be paid to pensioners till further instructions from this office. 3. In case of pensioners retired between 01.01.2016 to ”3451.05.2018, the revised order according to 7th CPC for individual case will be issued by the (Kendriya Vidyalaya Sangathan. in such cases also existing pension is to be revised with effect from August 2018 and the arrears of pension for 7th CPC will not be paid till further instructions from this office. 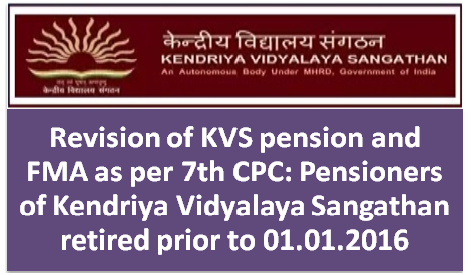 It is relevant to mention that with effect from June 2018, the Kendriya Vidyalaya Sangathan is issuing the Pension Payment Orders as per recommendations of 7th CPC. 5. The Govt. of India; Ministry of Personnel, PG & Pensions vide OM No. 4/34/2017-P&PW(D) dated 19.07.2017 has enhanced the amount of “Fixed Medical Allowance from Rs.500/- to Rs.1000/- with effect from 01.07.2017. The Fixed Medical Allowance (FMA) of Rs.1000/- is to be paid to all the pensioners with effect from August, 2018. The arrears of FMA i.e. from 01.07.2017 to 31.07.2018 will only be paid at the time of payment of arrears of pension in accordance with 7th CPC for which the necessary instructions will be issued by this office.